In a small New England town, over half a century ago, Jamie Morton encounters Charles Jacobs, the new church minister. When tragedy strikes the Jacobs family, the charismatic preacher curses God, mocks all religious belief, and is banished from the town. Jamie has demons of his own. Wed to his guitar from the age of 13, he plays in bands across the country, living the nomadic lifestyle of bar-band rock and roll while fleeing from his family's horrific loss. In his mid thirties – an addict, stranded, desperate – Jamie meets Charles Jacobs again. 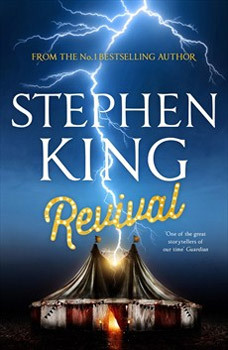 Their bond becomes a pact beyond even the Devil's devising, and Jamie discovers that revival has many meanings. Stephen King is the bestselling author of more than 50 books. His recent work includes Mr Mercedes, Doctor Sleep and Under the Dome, now a major TV series. His novel 11.22.63 won the Los Angeles Times Book Prize for Mystery/Thriller as well as the Best Hardcover Book Award from the International Thriller Writers Association.